If you are a shooter, you will agree that having a belt for your gun looks cool. However, there is more to having an authentic concealed carry belt that is made of leather rather than just a cheaply made waist strap. There is this unique feature of leather that makes it the most outstanding when compared to other materials used for gun straps. Moreover, leather was one of the first materials ever used to carry firearms in times of battle. Leather gun belt has more exceptional qualities than just its original appearance. They are tough and resistant to wear & tear, which makes them very durable too. They are reliable and you can be rest assured of using them over a reasonable period of shooting matches. Additionally, apart from leather belts, you rarely see any other type of gun belts that will give you that Cowboy look each time you draw your gun or walk the streets. Another great advantage of this belt is that it helps to keep your holster firmly and stationary. This makes it perfect for holding concealed weapons because it guarantees your safety and that of the people around you always. So, if you have not used leather gun belts for carrying your weapon in the past, now is the time to give it a try. But please don’t be mad at yourself for not knowing this secret before now. It will make no sense buying a belt that does not pass or fits the belt loops on your pants. They will be useless to you and end up as waste of money, time and effort. Therefore, it is advisable to always check the thickness and width of the belt you are buying and check if it can pass through the loops on your pants. What type of material was used for making the belt? This is another good question you need to ask yourself. Everyone wants to buy a product that will last them for several years. The only way to acquire a belt that will serve you for a reasonable period is by paying attention to the material it is made from. There are different materials used in the making of gun belt, but some have been tested to pass the test of time. Leather and nylon are the two most durable materials used, but the former is more rugged and durable when it comes to general features. This is the reason we are focusing on the best leather gun belt for the money available on the marketplace in 2017 and 2018. No shooter wants a belt that will make them feel uncomfortable in the field. This is why it is necessary to pay attention to the degree of comfort a gun belt offers. You may have to make inquiries from your friends, colleagues or family members that have used or are using a gun belt. Ask for recommendations and compare their suggestions. You can also visit online stores such as Walmart and Amazon to read customers’ comments on gun belts and go for the one that offers maximum comfort. This last point may not be necessary as we’ll be giving you a list of the best CCW belt on the market. You wouldn’t want to buy a belt that will be difficult for you to put it on, would you? So you need to go for a gun belt that is user friendly. Gun belts come in various prices due to the fact that they are produced by different manufacturers. 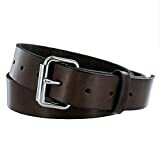 Most high quality leather belts are more expensive that the low grade gun belts. We shall be revealing to you the best leather gun belts that are budget friendly and yet have great qualities. This is one of the best leather belts you can get on the market. The Hanks Concealed Carry belt has unique shades of colors such as natural, oak, and chestnut. Besides color, this leather belt has no juncture at any point. This feature gives you the assurance that this belt will last for a longer period even when it is exposed to too much stress. In addition to this feature, this strap is made from vegetable tanned leather. This leather is stronger than the ordinary leather and can last forever. Moreover, it is bio-degradable and has a more organic appearance which makes it more environment friendly and durable than other synthetic gun straps. The Hanks belt also comes with a powerful nickel buckle that firmly holds it together. With a width of 1.5 inches, this belt may not be able to pass through all pants loops. You have to check it out before buying. This belt will be the perfect match for your needs if your aim is to get something convenient and lightweight. It is thinner than the Hanks full grain. This does not make it less rugged though. Aker Concealed belt is made from high quality leather. Moreover, this belt has been designed to be rigid yet flexible to conform to your body contours. Besides that, this gun belt was tested and approved by global federal agencies. This makes it more popular and a trustworthy belt for shooters. 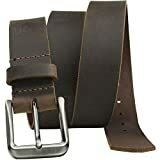 So if you are looking for the best leather gun belt for ccw, this approved belt by law enforcers will be a great choice. Additionally, this gun strap comes in tan and black colors. It is also filled with polymer to make it sturdy and firmer. This is a handmade leather gun strap that is manufactured in the United States. It is made from authentic full grain leather material that can withstand the test of time. It comes with a gunmetal buckle that holds it firmly during usage. The Nickel Free Roan is designed to have a comfortable feeling. With a lifetime warranty given to this belt, you can be rest assured of doing the right thing if you opt for this genuine leather gun belt. The width is 1-2 inches which makes it perfect for majority of pant loops. This amazing full grain leather gun belt has 2 color options (brown and black). The Relentless Tactical also has two designs. If you prefer the plain looks, the best option to opt for is the stitched design. However, if you want a belt with a more thrilling look, the basket weaving design will be nice for you. One incredible factor of this strap is that it’s handmade. This means that more precision, care, and excellence was imputed during production. The uniqueness of the Relentless Tactical strap makes them exceptional on the marketplace. The weight of this belt might be the only issue. It is a bit heavy to use and becomes tiresome to move around with it over a long period. Always keep in mind that gun belts are made from different materials and the best of them all are the leather types. Also remember that the top leather gun belt for you is the one that suits you most. Going through this our review will help you make the right choice in buying your dream product available on the market.